This trio keeps the somewhat familiar Archos branding – the number indicates the display size, while the suffix alludes to the "quality" of the product (i.e. Carbon is lower-end, while the Platinum name is reserved for higher-end products). The 35 Carbon is the smallest and packs the least impressive specs of the trio, but for $99 without contract, you shouldn't expect much in the first place. See? May be good for a child's first smartphone, I guess. The 50 Platinum isn't exactly going to break any records, but it's definitely a major step up from the 35 Carbon, in terms of size, spec, and price. For $200, this one is actually pretty usable and will keep you away from having to sign a contract. Sure, it's no game-changer, but for the price, it's at least worth considering. Maybe. The 53 Platinum is, of course, the largest of the three. Under the hood it's nearly identical to the 50 Platinum, though it does house a larger battery to help power its 5.3-inch display. The 53 Platinum will set you back a reasonable $250 – not a bad price for someone looking to enter the oversized-smartphone market on a budget. All three devices feature a "pure, un-skinned" Android experience and will be available at the end of May beginning in Europe. Denver, CO – April 18th, 2013 - ARCHOS, a pioneer in AndroidTM devices, is pleased to announce its first line of GoogleTM certified smartphones. Each smartphone will feature a super slim design, IPS screen with amazing viewing angles, a powerful Qualcomm CPU and the flexibility of dual SIM cards which allow the user to manage two providers simultaneously. 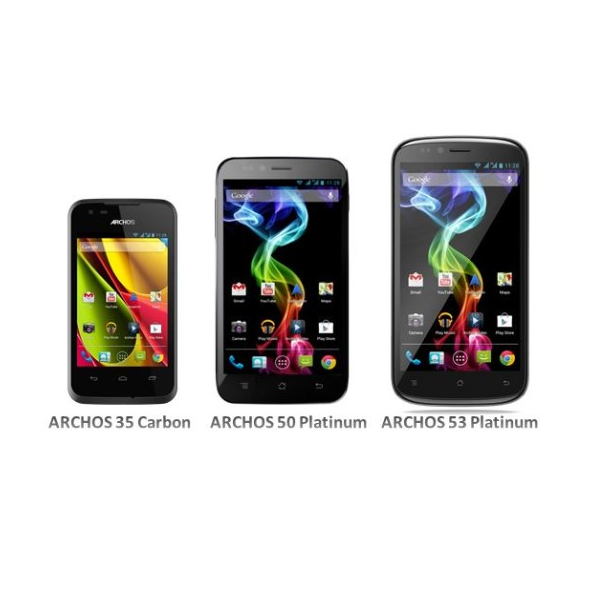 The ARCHOS 35 Carbon ($99.99), ARCHOS 50 Platinum ($219.99) and ARCHOS 53 Platinum($249.99) will be the first in a new line of smartphones to be released and will be available starting in Europe at the end of May 2013.